← Is natural selection science (or philosophy)? The first is that, as the previous post suggested, in practice the talk of limiting the boundaries of science, which Joshua Swamidass has been stressing for a while now, is a bit like asking governments to give up powers once they gain them: there is always a reason for scientists to keep whatever they have a liking for within “true science”, and only to exclude what the majority, at least, dislike. And so God-talk may be excluded by methodological naturalism. Conversely, whatever is philosophical, metaphysical, or even fundamentally religious (like the concept of “laws”) within scientific practice can be called “science”, thus enabling scientists to claim that they don’t do metaphysics, and that philosophy is for armchair intellectuals who don’t get their hands dirty in the “real world”. And so (in the context of the discussion) science as “the study of the repeatable” gives itself a free pass to comment on the contingent and “random” as well. But the second reason is what I consider a failure to distinguish theistic evolution (or Evolutionary Creation, if one likes that term) from the science of biology. Yet one must understand that the idea that “God uses secondary causes like evolution in his creative activity” does not correctly equate to “life arises via what the theory of evolution describes, and God is somewhere behind that process”. Once you introduce the living God to the discussion, science becomes only a small part of the issue: theology, philosophy and metaphysics, and a whole lot more besides, become necessary matters to keep on the table. My contention about the role of contingency in science (ie that it lies outside its methodology), then, may indeed be philosophical rather than scientific, but God doesn’t do science in isolation, so neither should TEs. A personal analogy for the difference between biological science and the story of life may be seen in the difference between my own profession of medicine and the story of health. The medicine in which I was trained, particularly in retrospect, had enormous blind spots because of the tradition from which it arose. The germ theory of disease was still very important: killing the pathogens involved in sickness was the purpose of all those expensive antibiotics and antivirals, and even of vaccination. Far less (by which I mean, not at all) emphasised were the intrinsic causes of susceptibility to infections which a system like that of Hippocrates had taught. And medical genetics had scarcely been invented (nor its shortcomings suspected). Likewise the placebo effect, instead of being seen as essential for any true medical system to understand and harness, was seen merely as a null-hypothesis in drug trials. It was more important to tell patients the scientific facts than to focus on the psychology of recovery and speak to that priority. 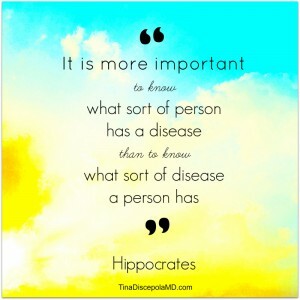 Most clinical doctors, too, have only a loose awareness of epidemiology, and (for very good reasons of the limitations of professional responsibility) most of us are concerned with the sick patient in the chair or bed opposite us rather than the broad sociological causes of ill health. Arguably, though, changing the nation’s economic structure or employment legislation – or campaigning against the definition of “sexual health” as the mitigation of the ill-effects of licentiousness – would do more than all of us clinicians combined. My previous argument, then, had behind it the idea that, whilst tracing the natural selection of lactase persistence since the invention of dairy farming may be valuable – and the study of such mechanisms in antibiotic resistance or cancer “evolution” even more so – they have precious little to do with Evolutionary Creation, which is all about how God produced actual specific outcomes, and not how “fit” a trait or organism might theoretically be “on average” if the process were run several times to obviate the effects of cruel contingency. 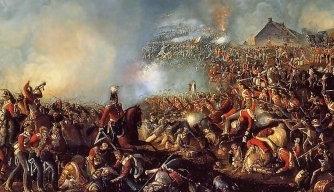 To repeat my military analogy, it’s really not that useful to run computer models to find out how often Wellington would have won the Battle of Waterloo under different weather conditions, or if knife-edge decisions had gone a different way. The contingencies did not interrupt the history – they were the history by which the power structures of Europe changed – and according to the biblical doctrine of providence, by which God changed them as Lord of History. Likewise contingent events do not interrupt a God-given process of evolutionary creation: they are that process. One BioLogos commenter queried whether the KT event was a possible intervention of God within the history of life. But if God is “behind” evolution, the question is a no-brainer, because the whole course of evolution has depended on contingent catastrophic events. Darwin really ignored such possibilities, because at the time of his work there was a polarised debate between geological uniformitarianism and catastrophism – and he was on the side of the former, having imbibed his geology from uniformitarianism’s champion, Lyell. Now, however, we know of five major extinction events during the phanerozoic, although there were several important ones in the Precambrian too. There were even more, depending on ones criteria – Wikipedia lists 26 overall. Not only were these responsible for a large proportion of the total number of extinctions of taxa that have occurred, the Permian event destroying perhaps 90% of species, but in the words of one palaeontologist and evolutionary biologist on the BBC this week, they actually “reset the earth’s biology.” Perhaps a majority of major taxa arose from evolutionary radiations following mass extinctions. That is indeed a significant recalibration of nature. Since these events have occurred every 30 million years or so, attempts have been made to identify a repeatable (and so scientifically law-like) cause. 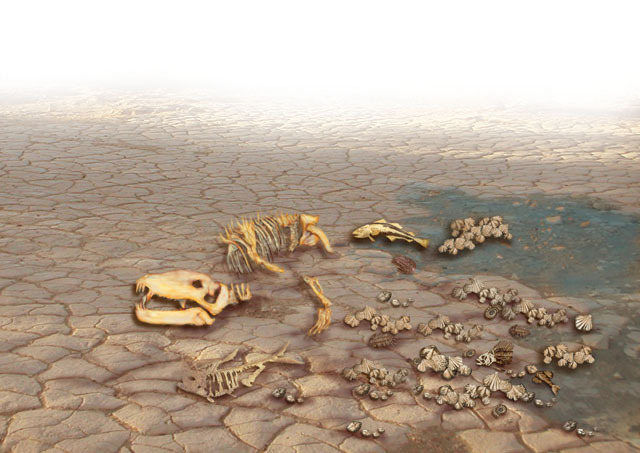 But the best evidence seems to be that mass-extinctions occur from causes as disparate as supernovae and tectonic shifts, perhaps coinciding with the final stages of biological stresses of various kinds. The triggers, then, vary widely and apparently contingently. The first oxygenation event, that decimated the cyanobacteria, was probably biological – the evolution of photosynthesis (that itself from a highly contingent symbiotic event). The glaciation “Snowball earth” 650m years ago did for the stromatolytes and allowed the radiation of the Vendian biota, which in turn may have succumbed to an (as yet unidentified) extinction leading to the Cambrian explosion. 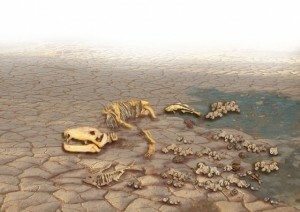 Desertification owing to the supercontinent of Panagea is a possible (and never repeated) cause of the Permian extinction. Extreme vulcanism and oceanic anoxia probably caused others. The KT extinction is the most widely known. Although opinions vary as to the extent to which the Chicxulub asteroid was the trigger for this, it makes a good example of contingency to examine, for the event led to the “age of reptiles” giving way to the “age of mammals” (ie us – though interestingly there are still more species of reptiles than of mammals today: the important thing is ecological dominance). Also there has not been a global catastrophe on the same scale since, suggesting that the extinction was not simply “going to happen anyway”. 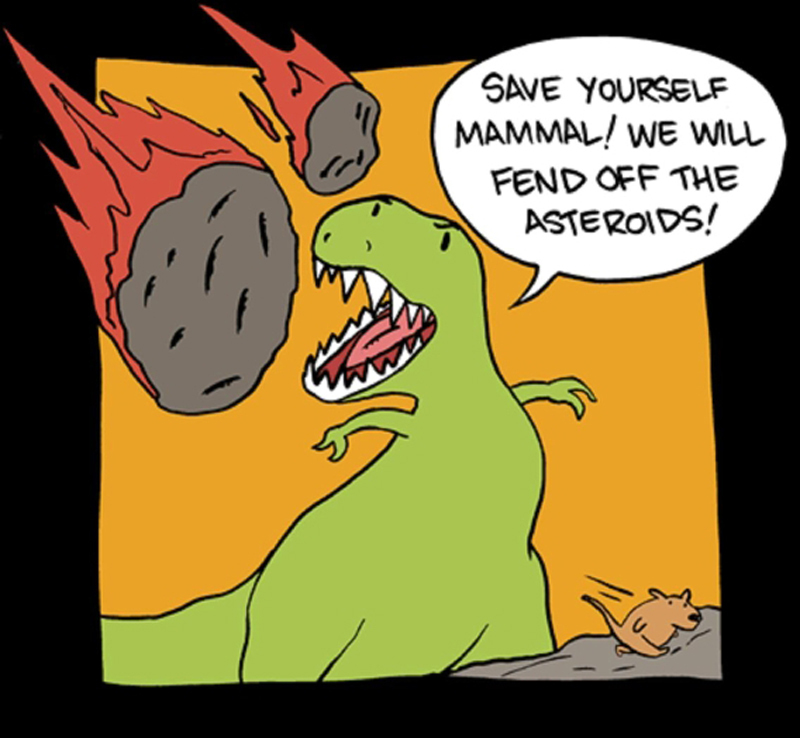 Dinosaurs may well still have been dominant today but for a falling rock. So let’s consider Chicxulub as one of those “contingencies” that rudely interrupted the “proper” evolutionary process of natural selection. 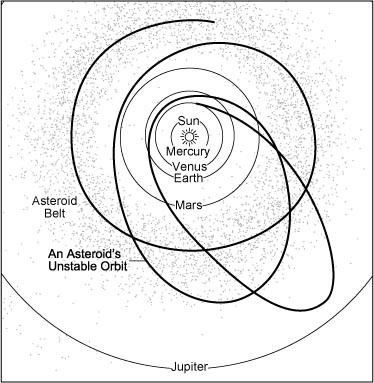 Now, considering the asteroid as “the” significant event, we could run computer models based on orbital mechanics to question what the probability was that the asteroid would strike the earth, or else miss it. Of course, we have no concrete data, but the multi-body problem of gravity is such that small objects in the solar system are usually near the edge of chaos. It’s a fair bet that in most simulations, the Chicxulub asteroid would miss the earth. And that’s about as useful as simulating a French victory at Waterloo, for here we are, and there went the dinosaurs. The grand direction of our evolution was decided not by natural selection, but a providential catastrophe. I argued before that natural selection itself, considered in its usual real-world setting, is just as unpredictable, if less global in its outcomes. This is increasingly so the more other mechanisms have to be factored into the much-modified Darwinian system. The model has to include guesstimates for average rates of mutation, rates of neutral evolution, niche construction, cultural evolution, sexual selection, horizontal gene transfer, epigenetic factors – and most importantly the fact that all these factors are interdependent, so that an error in one value may render the prediction valueless. This was ably described, with regard to human economics, by Friedrich August von Hayek in his 1974 Nobel lecture. Even then, biology was seen to constitute the same kind of “organised complexity” he saw as being beyond adequate mathematical modelling in the social sciences, rather than the simpler order of complexity seen in physics. The astonishing interdependence of elements even within the genome (challenging the very usefulness of the term “gene”) has now put this conclusion beyond reasonable doubt. So there may well be lawlike processes within evolution, some of which may be invaluable in solving human problems. I’m not so sure that natural selection is one of them – as in the case of human lactose tolerance, one can only really pin down the concept when it is cashed out into the real currency of specific genes, functions and history. Nevertheless, even if NS is one of those lawlike, truly scientific, definable entities, in practice it forms part of a contingent – and in many ways, if we include extinction events, chaotic – system. Which thread at Biologos was your comment in? Foolishly forgot to link! Here.